Randal Birkey has created architectural illustrations of many Frank Lloyd Wright architectural designs for his personal portfolio of architectural illustration work. 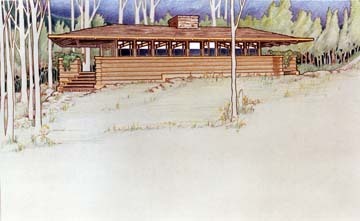 This rendering is based upon a summer cottage design and sketch of Wright’s. The medium Randal used is color pencil on 20″ x 30″ medium gray illustration board. It is interesting to work in both directions from neutral gray, adding light colors and dark colors from the middle of the value range.